This HiRISE image shows part of a large mass of layered rock in Galle Crater, in the southern cratered highlands of Mars. At low resolution, layers appear as bands and swirls which are nearly horizontal. This causes them to interact dramatically with topography, producing the appearance of folds and loops wrapping around small hills much like lines on a contour map. Zooming in at higher resolution, some long cracks (hundreds of meters long) are cutting across the layers, generally trending northeast-southwest. At full resolution ( PSP_002655_1280 ), details of the layers are often obscured by ripples of wind-blown dust or textured patterns of erosion now eroding the rock. In the best exposures, such as that in the cutout section, the layers are fractured into blocks. Some of the layers are relatively resistant, and appear as ridges or fins in the cutout, often with little material supporting them from below. Although this seems to indicate relatively strong, coherent material, few boulders are visible. 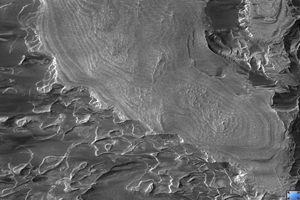 The ridge-forming layers may be weak, but separated by material with virtually no cohesion. Polygonal fracture patterns in the dark regolith between distinct layers could be due to ground ice, or regional tectonic stresses.